A one-hour voyage of Oahu's best sights and landmarks, departing from Ko Olina on the West Side of Oahu. Ko'Olina means "Place of Joy" in the Hawaiian language. 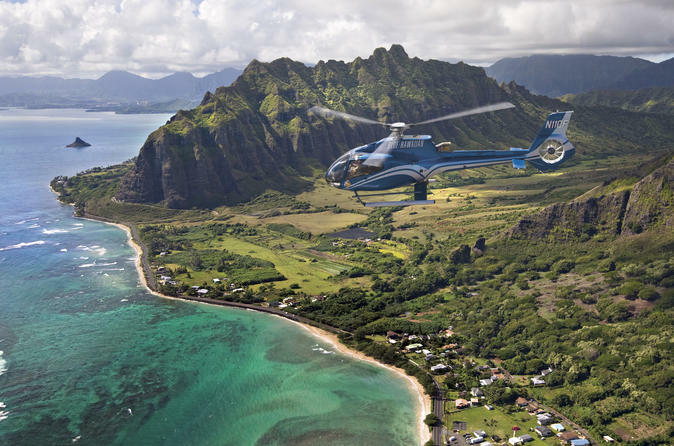 Blue Hawaiian Helicopter's "Oahu Spectacular" departs from this beautiful, legendary resort area and brings you all the visual joys of Oahu in one phenomenal tour. You'll experience the legendary vistas of Waikiki Beach, Diamond Head's extinct volcanic crater, the pristine coral reefs of Kaneohe Bay, the landmark of Chinaman's Hat, the "Jurassic Park"-like cliffs of the Nuuanu Rainforest, the breathtaking North Shore and Sacred Falls, the panoramic Dole Plantation, and the unmatched power and emotion of Pearl Harbor and the Arizona Memorial. All of this on the state-of-the-art Eco Star, purpose built for air tours. Unforgettable.